Today we follow many roads, many of which carry the number 97. US-97 first up the Okanogan valley. 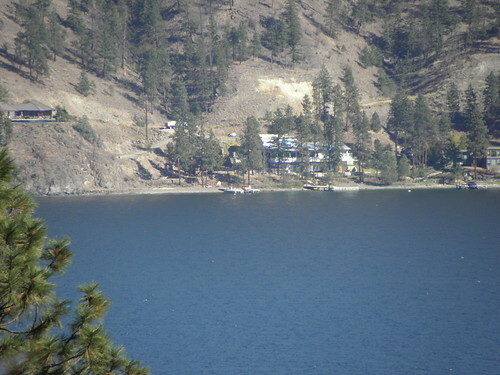 The Okanogan hav a very interesting history ect. ect. 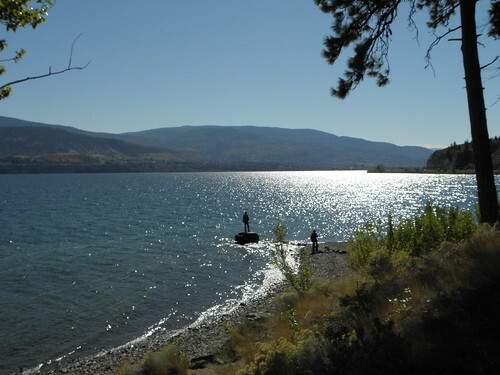 including the fact that north of the 49th parallel it is called the Okanagan. And, er, OK, not that interesting. It also smells of apples, or would if it was warm enough to have the roof down. Which it isn't. After not very many miles there is a big Sheds. On the other side of the Sheds lies Canada. In an appendix to the Sheds is the Man with a Gun. Who in this case is a Lady with a Gun and very pleasant she is too. Not like the grumpy sod at Abbotsford. North of the border is much the same as south of it except that the apples give way to grapes and you cannot go more than half a mile without passing another winery. I have never sampled Canadian wine and doubt that I ever will but given that the 49th parallel also passes smack through the middle of Karlsruhe there is no reason to exclude it from consideration on the grounds of being Too Far North. US-97 does not have a visa to enter Canada, obv, but disguises this fact by turning into Highway 97. 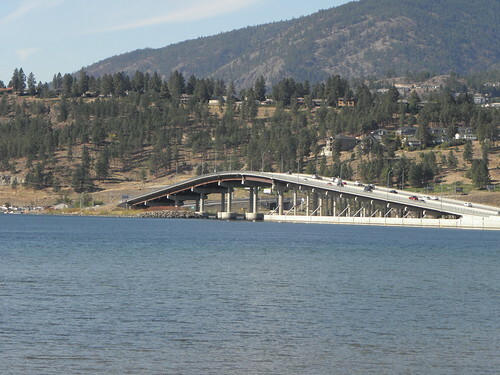 North to Penticton and then up the west side of Okanagan Lake. The lake is a bit like Loch Ness in that it is long and thin and has a monster in it. No, really. The monster is called "Ogopogo" and tales of Ogopogo date back to the 19th century or, put another way, suspiciously late. I have a notion that the First Nations of the area may have made it up to take the deserved piss out of the white man. No brawny check-shirted lumberjacks in evidence though, singing or otherwise. Not far from here one is back on Highway 97. Well, Highway 97C. 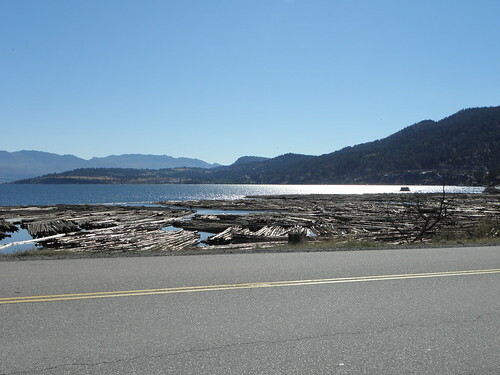 Travellers should note that if one is planning to travel roughly 90 kilometres along Highway 97C and one's motor-car says that it carries enough motor-spirit to travel 100 kilometres it should not be assumed that the available range will be greater than the remaining distance along Highway 97C. Because there is a 1000 metre big mountain in the way. 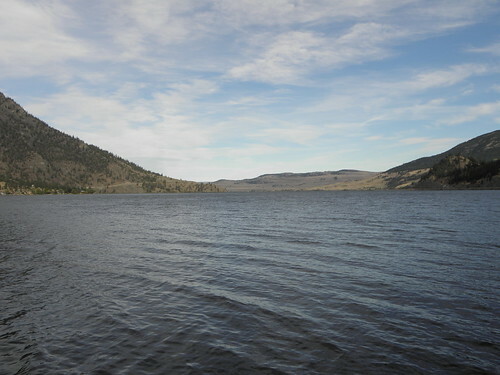 Fortunately there motor-car recovered its composure to tell me I still had 2 km outstanding when I reached Merritt, being the first place along said road wherein motor-spirit might be obtained and no, it appears that I have not learned my lesson from last year. 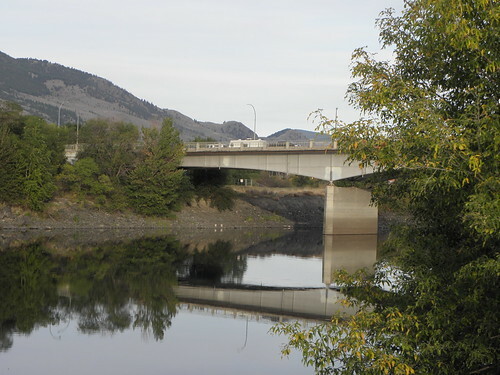 From Merritt one can stooge straight up Highway 97 5 to Kamloops, or one can take the imaginatively named Highway 5A, which is not a dual cabbageway and has corners on it, and lakes and so forth. I thought I saw a monster in here but it turned out to be some kind of grebe or other duck-sized waterfowl chiz. Highway 5A is mostly empty until it encounters Kamloops, which is not empty to the tune of over 80,000 people. And has some bridges in it. I couldn't get all of it in without borrowing the boat which is just out of shot or else walking on the water. Give our love to Kamloops where we spent a couple of good nights visiting the excellent swimming pool!